The internet has been buzzing about the New York Fashion Week for months and BOY did it come to a climax! Designers really have outdone themselves this year with their sharp, fresh take on fashion for the rest of the year. I'm not one to follow fashion trends but I was pleasantly surprised by what I saw! Michael Kors: I love the blunt red colour that echoed throughout Kors collection. 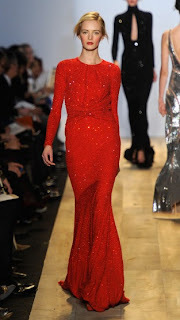 Michael Kors: Kors always has a stunning evening wear and he didn't fail to impress with this gorgeous, sequinned, red number. 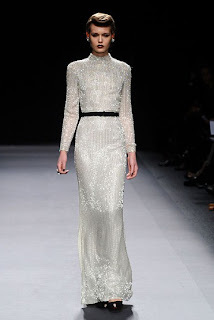 Jenny Packham: I've never come Jenny Packham's designs before but I am in LOVE LOVE LOVE! Her designs ooze sophistication and this tailored dress is absolutely gorgeous! Jenny Packham: This pale blue dress is beautiful. I adore how the dress is draped around the model. The crystal detail at the top adds an extra dimension to the dress. This design is going ti infiltrate down to the High Street in no time. Marc Jacobs: I am a massive Jacobs fan and I LOVE this dress. It is hard, edgy and grungy but the soft make-up adds a subtly femininity to it. It is a reflection of looks gone by but why fix something that isn't broken? Marc Jacobs: Metallics are here to stay!!! 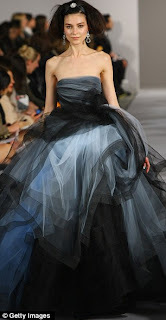 Oscar Le Renta: Oscar Le Renta's dresses need to introduction so just enjoy these next few pictures. Tory Burch: I really like the material of this dress. It is tailored without being too structured, and floaty at the same time. Burch's colour palette for this collection is a lot of dark, sombre colours which is different and sets her aside from some of the other designers. Tory Burch: It was refreshing to see something on the catwalk that I could see myself wearing to work. Whitney Port: Port has had a lot of criticism for her new collection but I actually really like it. She has pieces of clothes that I can see myself wearing and actually investing in. This neutral coloured dress, in particular, made me fall in love with her designs because of its simplicity yet statement look. I cannot wait till these looks infiltrate into the High Street. What new fashion statements are you excited about?